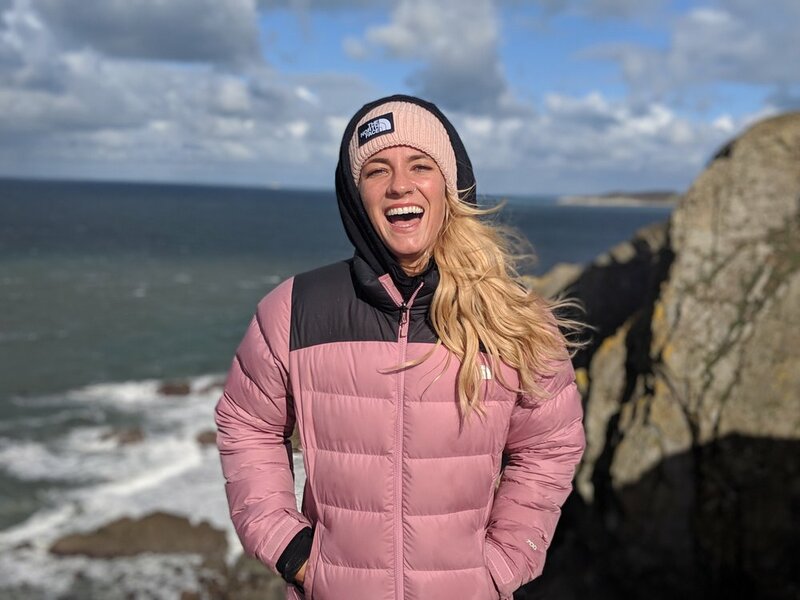 As part of the New Explorer initiative with The North Face, I looked back to the places, the people, which had inspired me along my journey to founding my business, Mad To Live. Having spent my formative years adventuring and surfing in Devon, it was on one of my many trips the seeds were sown for me to develop the courage to create my business. I cared and continue to, passionatly, about giving more girls and women access to the joys and happiness of exploration, of the outdoors, and of forging meaningful new friendships. And so with our 6 winners, we headed to Croyde, Devon, a place with deep meaning in my heart, for a special adventure. We exploried the wild outdoors, hiked through the National Trust ragged and raw lands, explored cold waters, and joined in yoga practice and meditation. The natural beauty of this area has long galvanised and inspired me, and getting to share this with 6 brilliant women who I was lucky to spend time with on this weekend, was really a special experience. 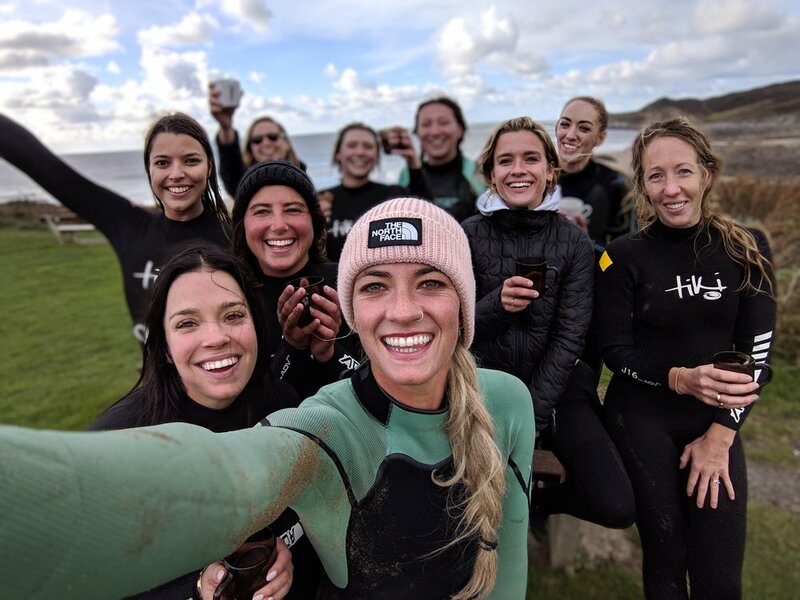 We were stoked to score great surf conditions on the first day, and as we stretched out into a candle lit practice by Mad To Live head yoga teacher Lucy Sweeney, plus an intention setting of exploration, the days adventure was happily embedded in our hearts. The soulful act of breaking bread together after a days adventure is always a personal highlight of mine on Mad To Live, with POTENCY providing an unbelievable spread every day. From harissa and manchego omlettes, to expresso banana bread with cherry cardamon compote and tahini cashew cream (recipe coming soon to the blog! ), pulled smokey BBQ jackfruit burgers with winter slaw, whole roasted cauliflowers with creamy carvolo nero, butterbean mash, mushrooms and chesnuts to sweet potato and fig pancakes, the post-adventure hungry souls were well nourished through the weekend. Bonding over dining is something I have loved through out my life, and the enjoyment of food, of it’s nourishment, and over sharing it with friends something I always look forward to. Check out the full edit of the weekend, and check out more on Thermoball and The North Face here. I've heard this sentence a few times this year and it has resonated, both in the back of my mind, and with powerful, firey prominence at it’s front. The Mad To Live journey started with a kernel of an idea around 5 years ago. What has organically evolved since then is a global mission I am passionate about to the core. I become more entrenched in it, reaching more and more women, and men, around our righteous planet, connecting with and sharing both playful and fun,and more meaningful and emotional stories, in a physical capacity with @madtoliveretreats and through my writings and adventures.The nucleus of the mission and message of being sharing a positive message of empowerment for women through creative adventure in the Great Outdoors, exploration, play, being yourself and the meaning in finding powerful friendships and bonds between women is and always be the crux. These impactful moments, relationships, encounters, and connections I have had with other women through Mad To Live, and knowing if it has in anyway, big or small, resonated or impacted, brings me so much it's hard to word. I guess I just had in my wildest dreams a hope those who connected with it would find some meaning, fun or feel good in any kinda way.